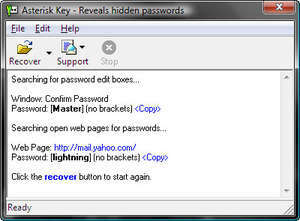 Asterisk Key is one of the freeware applications offered by Passware. It effectively reveals the password of many programs in Windows XP such as those for your email client, network connection passwords, web site passwords and anything hidden behind asterisks. The utility can check all open password boxes and attempt to reveal the password behind the asterisks (or stars). Single click, quick access to hidden passwords on Windows. Version 10.0 is a freeware program which does not have restrictions and it's free so it doesn't cost anything. For security reasons, you should also check out the Asterisk Key download at LO4D.com which includes virus and malware tests. Additional screenshots of this application download may be available, too. 3.8 out of 5 based on 39 ratings.